The Indigo-banded Kingfisher (Alcedo cyanopectus) is a River Kingfisher that is endemic to the Philippines, where it is a generally uncommon but locally common resident of the northern and central islands. There are two subspecies, the nominate race, which occurs on Luzon, Polillo, Mindoro, Sibuyan and Ticao, and A. c. nigriostris, which is found in Panay, Negros and Cebu. Its natural habitats are subtropical or tropical dry forests and subtropical or tropical mangrove forests. 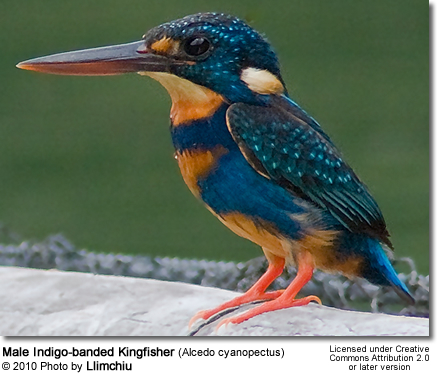 It forms a superspecies with the Silvery Kingfisher of the southern Philippines. 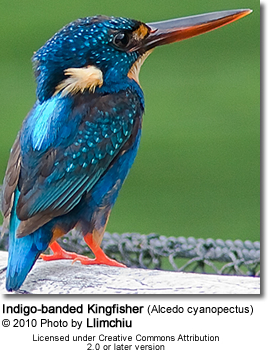 The Indigo-banded Kingfisher feeds on fish and aquatic insects. It perches on rocks and overhanging branches and foliage and dives steeply into the water to catch its prey. Once caught, it returns the prey to the perch where it is beaten and swallowed. Little is known about its breeding behaviour, although it is known to nest in tunnels dug into the banks of streams and rivers.